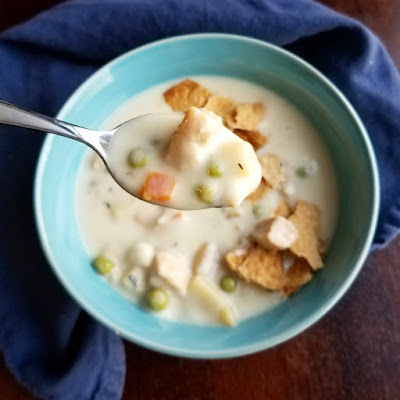 Comfort in a bowl, this creamy chicken pot pie soup has all of that delicious pot pie flavor in soup form. It is easy, delicious and will warm you to your core! To me a major part of the draw of a soup on a cold day is the warm comforting hug it gives you from the inside out. There is just something so cozy and homey about a nice bowl of hot soup. Very few things get more cozy and homey than a homemade chicken pot pie. So, why not bring two of the coziest homiest deliciousest (sure, why not?!) things around together for the ultimate comfort food in a bowl! This could easily be made with leftover chicken if you have it. Otherwise a couple of boneless chicken breasts or thighs will be perfect. Then you are just a few minutes away from a hot bowl of love. The creamy broth, chunky veggies and bites of chicken are a perfect base. This time I used biscuits as my topper and the buttery goodness adds that extra layer of special to the bowl. My cousin Cori makes a delicious chicken pot pie soup too. She puts bits of baked off pie crust on hers and that is amazing as well. No matter how you top it, just promise me you'll make it! What are your favorite fall and winter comfort foods? We still have a few good months of cold weather left, so there is plenty of time to enjoy! Comfort in a bowl, this soup has all of that delicious pot pie flavor in soup form. It is easy, delicious and will warm you to your core! In a large soup pot, heat oil over medium heat. Season chicken with salt and pepper and brown chicken on both sides. It doesn't need to be cooked through, but it should get a nice color on the outside. Cut the chicken into cubes and return to pot with onions and garlic. Add chicken stock, being sure to scrape up all the good bits off the bottom of the pan. Add the potatoes and carrots and bring to a boil. Drop heat to a simmer and cook for 20 minutes or until the vegetables are soft. Mix cornstarch into cold milk and then stir milk mixture and thyme into soup. Bring to a simmer to thicken. Serve with warm biscuits or bits of baked pie crust. Not only have you reminded me I haven't made a chicken pot pie in awhile, now I want to make the soup!!!! Yum! Have a wonderful weekend sweetness!! I love food like this. My mom happened to make pot pies for dinner last night too... so we've been in pot pie heaven. So perfect for this cold snap! Hi Carlee and happy new year. I have never made this type of soup but it sure looks like a winner. I will give it a try. I hope you love it, Julie! Happy New Year! Yum! This sounds good and rib-stickingly warm. It is going to be really cold this weekend and I think this will top the menu! I had a container of crescents in the fridge and rather than unroll them I sliced them and baked them in circles. Those would be good with this too. Sort of like the topper for a pot pie. Have a great weekend. That is a great idea! It is a great way to fend off the cold to the bones weather we have been having. Thanks, Linda! Thank you! It was really good on there! I've been wanting to make a chicken pot pie soup, so you've definitely reminded me of that! Thanks for the great share - it looks wonderful! You definitely should make some! Thanks! After seeing the photo of this yummy soup on Instagram, I had to come get the recipe! Pot pie is a favorite and warming soup is a necessity right now! Yes it is! I can't wait for winter to be over, but I do enjoy the excuse to make lots of soups! Thanks so much for stopping by. This looks amazing! Can't wait to give it a try. Thank you for sharing at Merry Monday! Thank you! It is definitely a winner! Hi Carlee, I think I may have mentioned it several times before, but I do enjoy a nice soup on a cold winters day. I don't think I have ever heard of pot pie soup before (I lead a sheltered life!) and this sounds tasty. I wonder if it would work with dumplings? It would work perfectly as a base for dumplings! You could probably leave a bit of the starch out of the broth as dumplings (mine anyway) tend to thicken the broth a bit on their own. Now I am super hungry for some chicken and dumplings. That is one of my favorite comfort foods... I really need to get a recipe on the blog, but I make them differently every time so I am never sure what version to share! 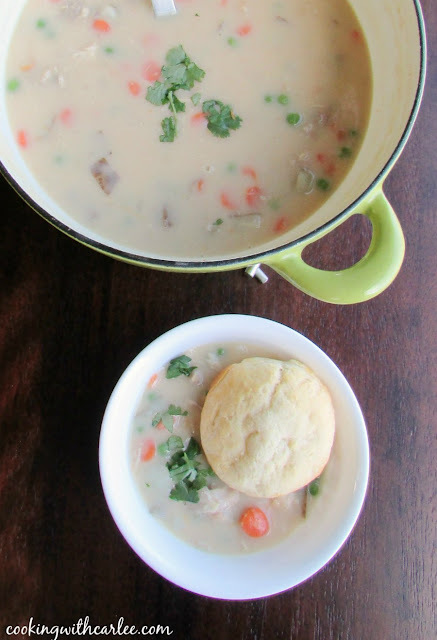 I never heard of Pot Pie soup but will be giving it a try this weekend! This looks amazing! Carlee, you know that I am a huge fan of soup to warm me up from the inside out. And this one is not only a soup to warm me up but it is one that brings back fond memories from childhood. For some reason when I was a kid I used to love pot pies, the cheap banquet style. Now that I'm all grown-up this is perfect! And it's gluten free. I am so excited. Pinning this I am going to make it very soon. Thanks for sharing. We used to always have those pot pies when my parents would go out and we had a sitter or had to fend for ourselves. They were fun and have good memories for me too! Now I'm spoiled by homemade pot pies. Either way, the soup is a winner! Thank you, Nikki! Oh, yum! Now this looks like comfort food! Pinned and sharing. Thank you for joining us at Family Joy Blog Link-Up Party. I hope you will join our next party starting Sunday at noon EST. It is definitely a big bowl of comfort. Thank you so much! 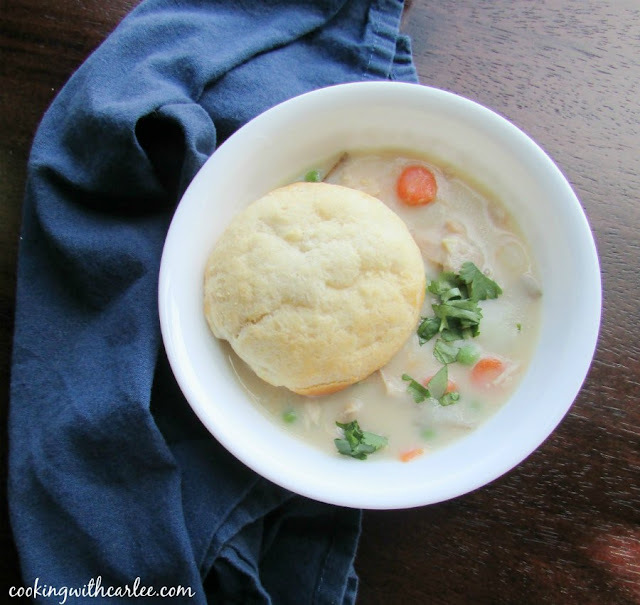 You better get on it, chicken pot pie soup is definite winner! 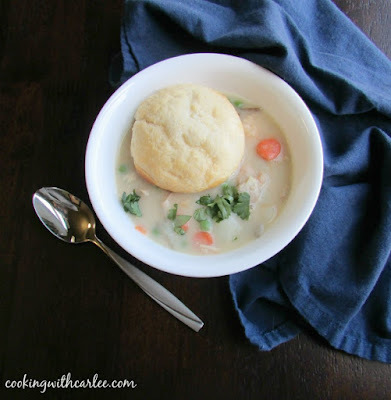 Your Creamy Chicken Pot Pie Soup looks fantastic! Hope you are having a great week and thanks so much for sharing your awesome post with us at Full Plate Thursday. We look forward to seeing you again real soon! It tastes just like the pie but without the fuss! I love the idea of turning pot pie into soup! It's so easy and just as delicious! This is perfect for the colder weather! It really is so warm and comforting! I love chicken pot pie soup and this looks fantastic. I could use a dish right now! Me too! It's so warm and cozy! Pot Pie AND soup combined?? I'm so in!!! It is like a warm bowl of comfort!